The only people calling for a free market in carbon are the people who don’t know what a free market is. Sometimes a free market is just a dumb idea — like when trying to run a global market in a ubiquitous gas molecule that is intrinsic to life on Earth and oceanic chemistry. Worse, we think we might do it in countries with weak law and order, and high rates of corruption. Even sillier than that, we’re trying to sell units that depend on intentions — was that a sincere new attempt at carbon reduction or were you going to make less anyway? This is such a big-government leftie idea. If someone discovers a diamond deliberately, does that make it worth less on the market? Adam Smith would be rolling in his grave. A reduction is a reduction, and all CO2 molecules are the same. But therein lies the rub. The biggest market player is Summer. The analysis indicates that about three-quarters of JI (Joint Initiative, meaning multi-country) offsets are unlikely to represent additional emissions reductions. This suggests that the use of JI offsets may have enabled global GHG emissions to be about 600 million tonnes of carbon dioxide equivalent higher than they would have been if countries had met their emissions domestically. They did a random sample of 60 projects and found barely 14% of the Emissions Reductions Units (ERUs) issued were “credible”. Fully 73% were not credible, and 12% were questionable. According to the BBC News Germany and Poland largely did the right thing, but Russia and Ukraine rorted the system (and what was going to stop them?). Apparently most of the projects to reduce emissions in Russia and Ukraine would have happened anyway. They were not “additional”. The carbon credit money was money for nothing. A lot of the other credits were paid to people who were probably artificially ramping up a gas called HFC-23 so they could “cut back” on this super-arch-villain of greenhouse gases and claim credits for producing less pollution. HFC-23 is the godfather of greenhouse gases: it’s 11,700 times as powerful at warming as CO2 is. The Russians and Ukrainians were just copying the Chinese and Indians who were rorting the exact same carbon-credit game five years ago. We have learned nothing. And “cut back”in gasses not true. h/t ClimateDepot — the place with all the news. 57 comments to Another carbon credit fraud – $2b. The faked fixed unfree market feeds crooks and makes no difference to emissions. To the believers, these stories are not evidence of a faulty structure but just small rust spots on a brilliant project. Observations are not the problem. Interpretations are the problem. The believers are the same who still argue that Pink Batts, Building the Education Revolution, GFC Bailout etc all worked 100% to achieve their intended aims. On a slightly different note, I think Australia can claim to have done more than any other country in averting climate change. For we were once told that without action, even the rains that fall will not fill our dams. It appears we have overcome that issue and now the dams are overflowing. I hadn’t thought of it like that and will have to use that riposte re having filled the dams. And the same ones who leave old russian nuclear submarines rusting away in russian ports so that the radiaoactivity slowly leaks and poisons whole eco systems…..you mean *those* people? Need 2nd coffee for the morning…..stat…. For the true believers this is simply the communism argument… “it never worked because it wasn’t implemented properly.” in other words, the ideology is flawless, but flawed humans struggle to reach the Utopian outcome. A good system recognises the flaws of humanity and builds safeguards accordingly. Levitt and Dubner have plenty to say on this subject (Freakonomics etc). The fundamental problem with many emissions trading systems is that buyer and seller can both come out ahead by cheating the system. But another question to ask is, what damages are inflicted by cheating the systems other than to the credibility of the system itself? The only people calling for a free market in carbon are the people who don’t know what a free market is. Not only do many supporters of carbon trading not know what a real free market is, they are highly antagonistic to their fanciful notions. Stephan Lewandowsky’s notorious Moon Hoax paper and follow-up US survey demonstrates this antagonism. Loads of VAT carousel fraud going on in Europe (or at least there was) a year or so ago. Not carbon credits as such but I wonder if this is the case in Australia as well? Thank you Ian for that missing piece to the puzzle. I knew tax payers and rate payers were being ripped-off. I knew many wind and solar companies were going bankrupt but I could not figure out how the $$$ were being siphoned off. 2 billion here, 2 billion there, after a while it adds up to real money. But the real amounts are those spent by the public for expensive “renewable” electricity without any choice or evidence that CO2 emissions actually occur. It’s the lack of choice that really hurts. Its interesting you point that out Ian. I was puzzled watching the 4 Corners report on Shorten, in that it raises some questions about the real motivation of Labour toward renewable energy. If we accept the proposition of 4 corners and Martin Ferguson that Labour is controlled by unions and particularly the CFMEU then how do we square that with Labour’s anti coal mining and anti forestry policies? Considering coal mines have to be built and that they ultimately are built to result in energy production. We can conclude that the CFMEU is actually against construction, forestry, mining and most current forms of energy. So why ? How could it be so ? 1. The CFMEU wishes to disband and destroying its industries from the inside is their chosen method of self destruction. 2. Labour is not actually controlled by unions and they are making policy regardless of the effect on the CFMEUs employment base. 3. The CFMEU has realized it can manipulate the AGW scare to transition “old economy” jobs to “new economy jobs” via Bill Shorten, at tax payers expense and look trendy in the process. Which seems most likely based on the observational evidence? Safetyguy66 asks why Labor Unions are working against the best interest of union members in Australia (and also here in the USA.) Remember the Unions supported Clinton when he gave US jobs, technology and the US economy to China and no doubt supported the group in Australia that also signed the World Trade Organization treaty and fights for unlimited immigration. Kent Clizbe answers that question. Kent served as a staff CIA case officer and also worked Counter-intelligence. He was a ‘Red Diaper’ baby born to an American Communist father. Russell’s spot-on understanding of how the communists worked, based on his own on-location observations in Russia during the revolution should have been useful to him during the next two decades of his work at Columbia. Yet, under his nose, communist covert influence agents like George Counts, who was under Russell’s supervision at Columbia’s Teachers College, used the exact tactics he described—talking, publishing, orating and haranguing, breaking down democracy from within, attacking the leaders, making people lose confidence—to destroy American society. ….In 1931 Houghton Mifflin published New Russia’s Primer: The Story of the Five-Year Plan, by M. Ilin, translated from the Russian by George S. Counts, Associate Director of the International Institute and Professor of Education in Teachers College, and Nucia P. Lodge, Research Assistant in the International Institute. The newly-minted “Russian expert” from Columbia delivered the KGB payload directly into the cultural heart of America. “Capitalism is corrupt! Russia’s experiment is working!” screamed his text. Of course, at the same time that Counts published this covert influence coup, Stalin was in the midst of forced collectivization of huge swaths of Soviet society. Dissenters were rounded up and shot. Or sent to the gulag, where they were worked to death, in the most inhuman conditions imaginable. Counts, who had visited Russia at least twice by 1931, could have witnessed the unimaginably squalid lives of normal Soviet citizens, if he had wanted to do so. Maybe he did, maybe he did not. We’ll probably never know, but we do know that he continued pouring out covert influence payloads for another decade. Counts cloaked his KGB payload in his work in Education with his participation in “non-ideological” organizations, like the Progressive Education Association, and the Philosophy of Education Society, for which Counts edited the journal The Social Frontier, beginning in 1934. Counts continued publishing, speaking, and teaching that “the age of individualism was over,” and that it was time to accept “collectivization” in the American economy. Counts continued advancing his KGB covert influence payload, always rejecting any suggestion that he was a communist, or inspired by socialism, cloaking his “philosophy of education” in Progressive terms…. ….amazingly, Counts’ covert influence payload is still required reading in many schools of education. ‘Progressive education’ was created by John Dewey… [in] his famous experimental Laboratory School where he could test the effects of the new psychology on real live children… the purpose of the school was to show how education could be changed to produce little socialists and collectivists instead of little capitalists and individualists…. High literacy gave the individual the means to seek knowledge independently. It gave individuals the means to stand on their own two feet and think for themselves. This was detrimental to the “social spirit” needed to bring about a collectivist society. The work to destroy our free society has been going on under our noses for over one hundred years. We are seeing the ‘end game’ CAGW is just a part of the ‘game,’ an excuse to remove even more of our sovereign independence and replace it with ‘Global Governance’ by unaccountable bureaucrats. The fraud is a necessary part of the scheme. The handlers are the ones who profit here. Just like government, the bureaus/bankers take in taxes and award them to the worthy. With a sizeable percentage going to fund the bureaucracy. The black comedy that is Indian and Northern Affairs in Canada operates on this plan. I guess if they keep looking hard enough for something that is not happening they will sooner or later find something. QUOTE It has already been happening for decades. Plants and animals are responding to rising temperatures. It is easier for animals, less so for plants. Species can sometimes change their physical location. They can also evolve as a response to changing conditions. Animals with short life spans and which breed profusely are ideal species to study these changes. Vanessa Kellerman and Carla Sgrò at Monash University study how flies are responding to warmer conditions. Their ranges are changing, and their genetics is changing. Scientists are asking whether species are able to evolve fast enough for the rapidly changing climate and whether they are able to resist high heat. Apparently the plants and animals weren’t told that the temperature wasn’t rising because they are moving and adapting! An adaptation to the dangerously low CO2 levels over the last few 100,000 years. So what do the plants say? My cool season white clover says it is nice and cool and no drought for the last three summers in North Carolina. It usually dries up and blows away but is instead blooming. So much for our 95F to over 100F summers and reported drought. My white clover agrees with ChiefIO’s tomatoes. The recent cold weather across North America has had a severe impact on the availability, quality and cost of tomatoes. Due to these factors, we will temporarily cease to offer tomatoes on your sandwhich. As soon as the tomato crop returns to normal we will add them back to your sandwiches. We apologize for this inconvenience…. And what is the response of the Warmists? Many over on WUWT and elsewhere have complained that their tomatoes will not set fruit over the last few years. But according to the UAH satellite data their hasn’t been any global warming for 18 years and 5 months. You can also check the planet by regions at Ken Stewart’s link, e.g no S polar warming for over 35 years, no N polar warming for over 13 years etc. And once you realise that the 1997-2001 El Nino was a SOLAR forced event that caused a step up of about 0.26C in the lower troposphere temperatures, then there is ZERO room for any CO2 warming in the whole of the satellite record. The slight warming before the El Nino has been cancelled by the slight cooling since. There is ZERO CO2 warming signature in the whole 36 years of the satellite temperature record. Coral and sea life rivalling that found on the Great Barrier Reef has been discovered in the waters south of Melbourne, Parks Victoria says. A remote-controlled vehicle was sent to depths of 100 metres by Parks Victoria to explore deep sea life in Wilsons Promontory National Park. Scientists are struggling to explain a dramatic turnaround in giant Australian cuttlefish numbers in South Australia. “Each winter the animals gather in the Spencer Gulf for the breeding season. Their numbers have been declining, from around 200,000 in the 1990s to just 13,000 last year. Locals were concerned there wouldn’t be any cuttlefish this year, but instead they returned in masses. The CEO of the Conservation Council of South Australia Craig Wilkins has welcomed the return of the cuttlefish. CRAIG WILKINS: Oh, it’s great news. It’s surprising, it’s perplexing, it’s exciting and it just shows how little we actually know. HMMMMmmmm Declining since the 1990s, about thirty years ago. We already know the salmon in the pacific northwest and the anchovies in South America respond to changes in the ocean ocillations so why not cuttlefish? A flock of silly sheep will always be eaten or fleeced. And “cut back” in gasses not true. The IMF and The World Bank try to do everything through creation of a `market.’ That’s their dogmatic approach. `Markets’ according to them, apply the `correct’ influences and send the ‘correct signals’ to `participants.’ Suitability of the `marketed product’ for a market does not seem to be considered. If sufficient contortions and distortions can be brought to bear to create a `market’ then, hey, The Perfect Solution has been applied. Anyone who can accept that, other than the most naive and innocent, knows that markets can be influenced, and, without solid law and full enforcement of that law, are open to theft, fraud and other forms of dishonesty and gaming. The history of the world’s stock markets is all about `selling short’ and the ruination of people both innocent and guilty as a result. Yet these organisations persist with their dogma. One has to wonder just why such imperfect systems continuously pushed at us. For those who have been watching the European Carbon Credits Market, all of this is nothing new. Of course, we can’t possibly accuse the market `pushers’ of such venality themselves, or their staff. Climate Depot on the Carbon Credit Fraud links to a long article by James Delingpole – ENRON ENVIRONMENTALISM. He compares the current carbon trading with the sulphur dioxide cap-and-trade. Enron ran it and was the major trader. Enron also funded green NGOs that campaigned for action on climate change, particularly for the Kyoto Protocol to be implemented in the USA. This is all just confirmation of George Orwell’s vision of a time when governments and other corrupt establishments reverse the meaning of words, such as peace means war. We now have global warming even though it’s not, perhaps even cooling. Next we will be forced to say black is white and left is right. I’m almost certain they will find reasons for such changes. When is a fraud not a fraud? When it’s about global warming alarmist lies. When is a lie not a lie? When it’s about the global warming fraud. Circular reasoning gone wild. I seem to remember that a past Labor Treasurer used to talk about “saves” when he meant higher taxes and “surplus” when he meant deficit. And Labour’s current position is to get involved in exporting Australian dollars into foreign carbon rorts as soon as possible. Will the gullibility never end. It’ s the ‘Settled Science’ wot does it, attracting all those crooks who took all that easy money from the program designed by people long on idealism and short on real world experience. But why is the alarmist fraternity so consistently gullible? Is it that the relentless propaganda promising imminent Thermageddon dulls the brain, or is it simply that not being very bright helps to make it easier to swallow the global warming fairy tale. The potential for umm, gaming the carbon (dioxide) credit scheme is something that will inevitably happen. Consider just the U.S. for example, and just the electricity power generation sector alone which only constitutes 40% of all CO2 emissions. That power generation sector alone emits close to 2.5 Billion tons of CO2 a year. At even a low price of $10 per credit, that comes in at $25 Billion, and again, that only covers 40% of emissions. When you’re talking $25 Billion, what’s millions here and there. It is going to be sc@mmed, and it’s going to be done on a large scale, and most of them will get away with it. It has absolutely nothing whatsoever to do with changing the climate. It’s only about the money, and that’s all it ever was about. There’s no altruism in this just because the cause is supposedly so good. This is a scheme designed to be taken advantage of. So may people will make so much money out of all this. And it’s basically just a user pays tax anyway, because all the emitting entities just pass the cost down to electricity consumers via an increase to the unit cost of the electricity they consume. It’s a money churning mechanism with little bits and pieces being siphoned off here and there, and when you’re talking in huge numbers like this, little bits and pieces amount to lots and lots of money. There is no altruism in all of this. It’s just for the money. Renewable energy is the fastest way yet invented to take money from the poor and give it to the rich. Never in the history of Science has a science been so reliant on so little uncorrupted evidence and data in supporting the scamming and stealing of so much treasure from so many by so few for so little purpose and outcomes. I have posted this figure before an no one has disputed it. According to http://www.manhattan-institute.org/energymyths/myth10.htm the amount of anthropogenic CO2 in the atmosphere as a proportion of all CO2 is only about 3%. Can someone confirm that the genuine science agrees with this? Prof. Salby is with you all the way. There is no discernible relationship between the total amount of CO2 emitted on the planet and our contribution. The variance in the natural sources can be many times greater than our total contribution. When you then try to relate that to a variance in average temperatures of around 0.3c over 100 years. Its like claiming you can measure a molecule accurately with a school ruler. We are witnessing guess work, urban myth, tea leaf reading and genuine opportunistic left/green propaganda posing as science every day now. Some of us can see it is baseless nonsense to even entertain AGW theory in any serious fashion. Others cant. Book can be downloaded for free. I read the 10 page synopsis, which was quite good. Prof MacKay seems to think that renewable energy could work, but his very first point when it comes to closing the gap between renewable energy production and consumption for Britain was. 1.Population reduction. They’re really going to be pushing molten salt storage now…. Oh dear! Give me strength. It’s been around for many years, and is actually in use already. What dear old Fran, bless her heart, is in raptures about here is melting salt compounds, and using the thermal heat to then, umm, make electricity, as Fran says. Hmm, let me see now. I wonder how they make the salts molten. Why, they use the solar power being generated to make those compounds molten. So, they have to use part of the actual power generation, and a pretty large part of it to do that. 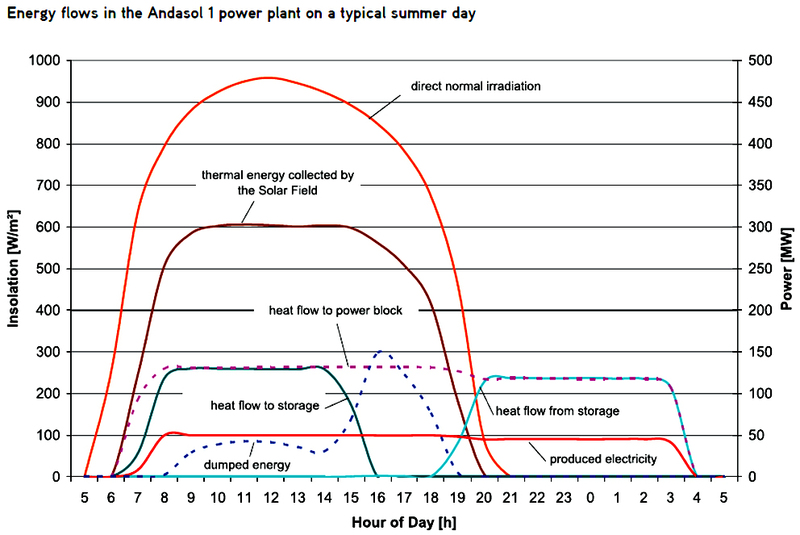 Look at the diagram at this link and see the breakdown of power generation with respect to solar input. Note that this will theoretically generate 50MW for maybe 18 or 19 hours, and be aware that this is just modelling, because the best they have done so far is only 20MW. The more heat they divert the less power available for actual use. Dear old Fran even got in the Baseload word. Oh dear! She also said, what would it look like in our home. The man replied that ….. “IF” someone did develop a home system, it would just look like a tank. Fran equated it with batteries as well. This is technology they have been working on for an awful long time now, and they still cannot reach that 50MW in the modelled diagram. And a home system. Good luck with that. Keep in mind it takes the generated power to heat the salts in the first place, so there goes the feed in tariff, and there goes even most of the power to actually run your home in the first place, as most of the power will be diverted to heat the salts compound. Ah, don’t you just love a good beat up from a clueless ABC hack. Oh, and incidentally, that plant in Spain which uses this technology and has been known to actually generate power for the full 24 hours and do it for almost 40 days in Mid Summer, well that plant generates as much power across the whole YEAR as Bayswater will generate in, umm, 40 hours. Fran says umm a lot too. There is nothing innovative in this at all. Years old technology, from way before its use in solar power. And that plant in Spain which has the greenies wetting themselves cost $472 million and delivered 17MW for 32 (or 36 can’t be bothered checking) weeks. It didn’t work for the 3 months of winter -guess why. This is the thing they keep talking about for Port Augusta when the 500MW coal fired station closes down next year. As a replacement … talk about numerically illiterate. I want to see Victoria close the electricity pipeline to SA…. … but they won’t, because they are making way too much profit. Found the original ABC story to be somewhat vague, what exactly were they doing with molten salt? The invention was being used to provide electrical load shifting for cooling. This is a glaring truth indeed. … so an international ‘carbon trading scheme’ complicated by UN ‘management’ and taxed by World Bank ‘administration’ has not a hope in Hades of achieving its proclaimed purpose. If CO2 is the problem it is purported to be, then a localized carbon tax is the only process which will work to move power generation and distribution to alternative systems. But the proposed process of redistribution via the offices of government is an obvious bureaucratic abomination waiting to happen. Such a tax would be better levied on an upwardly sliding scale based on usage, so ‘basic necessity use’ is not taxed, but if you want the luxury of running 10 air conditioners in your home, you pay steeply for it. This is an amazing video. It should be played at the opening session of the Paris-site conference and then they can all go home. 68min. But, perhaps there is a positive side to this, and maybe the success of these “dealings” will encourage more companies to engage in emitting and producing CO2 products for those of us who like a little CO2 now and then. Just by the way. I just noticed that the noaa MSL for Fort Denison has stopped at 2010. It was showing .65mm a year rise and no acceleration over 130 years. Will look at some others. —The population at large could be sterilized by infertility drugs intentionally put into the nation’s drinking water or food. Well they have been working on that. Barney Cohen reviews levels, differentials, and trends in fertility for more than 30 countries from 1960 to 1992. He finds evidence of fertility decline in Botswana, Kenya, and Zimbabwe, confirming the basic results of the DHS. What is new here though is his finding that the fertility decline appears to have occurred across cohorts of women at all parities, rather than just among women at middle and higher parities, as might have been expected on the basis of experience in other parts of the world. He also presents evidence that fertility may have begun to fall in parts of Nigeria and possibly in Senegal. I do not know how reliable that information is but I do know that Sterilization victims are going after my home state. And the neighboring state, Virgina has FINALLY decided their forced sterilization law should be repealed. …(March 25, 2013) Charleston, WV — The West Virginia House of Delegates voted unanimously Monday to repeal their “Sterilization of Mental Defectives” law, a eugenics law that sought to sterilize, and thus ultimately eliminate, persons deemed mentally “defective” and unfit…. …The Justice For Sterilization Victims Project is investigating whether to launch a legal challenge against West Virginia’s eugenics-based forced sterilization program and requesting that the State of West Virginia repeal its unconstitutional law immediately. I have been telling my local greenie friends not to have children as they believe that humanity is a vermin causing GW crap. They were shocked at the suggestion as obviously the vermin applied to everyone except them. In fact they normally accusing me on not caring and yet I am the vermin.